Why buy Lipton flavored tea from UFS? 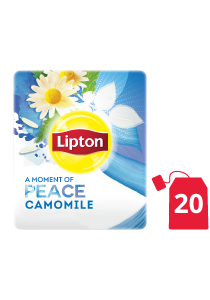 If your guests want something to soothe their tired mind, they'll love Lipton Camomile Tea, which is double chambered to infuse better and release fullflavour. The tea bags are packaged in envelopes, so you get the same crisp taste and aroma - from the first tea bag and the last. Tea bag application: 4 - 5 minutes infusion of teabag in boiling water (100°C).